Neo4j is a robust (fully ACID) transactional property graph database. A graph database stores data in a graph, the most generic of data structures, capable of elegantly representing any kind of data in a highly accessible way. 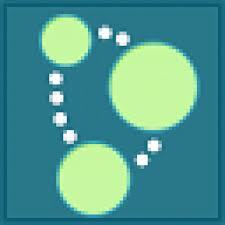 Due to its graph data model, Neo4j is highly agile and blazing fast. For connected data operations, Neo4j runs a thousand times faster than relational databases. And today we’ll show you how to get all these benefits in the cloud very fast and easy. Let’s get started! 3. 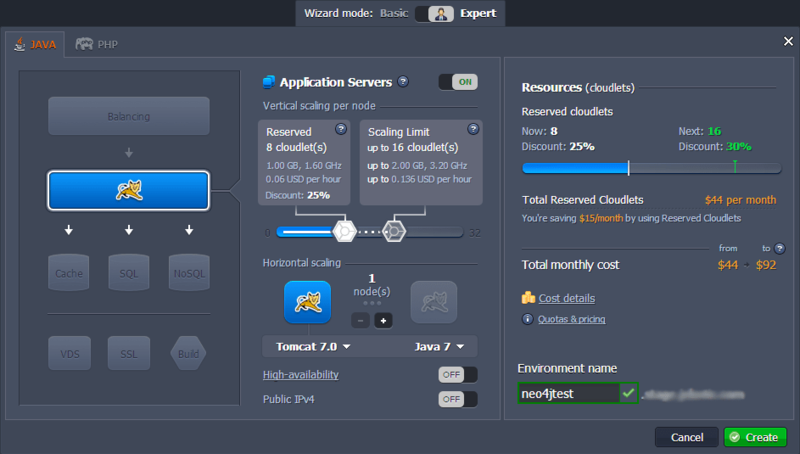 In the Environment topology dialog which opens, pick Tomcat 7 as your application server, set your cloudlet limits and type your environment name, for example, neo4jtest. Then click Create. Wait just a minute for your environment to be created. 1. It’s very easy to use Neo4j embedded in Java applications. Create the application with Neo4j as you usually do and build the war file. 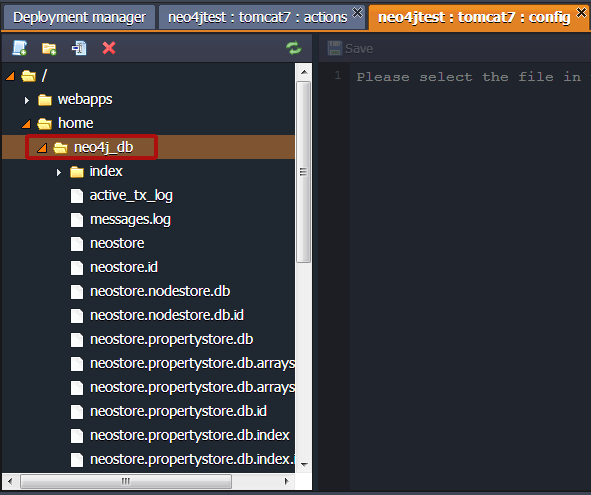 As you can see in this case our database will be stored in the home folder of Tomcat in neo4j_db directory. 2. Upload your war file to the Deployment manager. 3. Once the package is in Jelastic, deploy it to the environment you have created earlier. 4. Now you can open your application in a browser. 5. Check your application server’s log to check the results of program processing. 6. 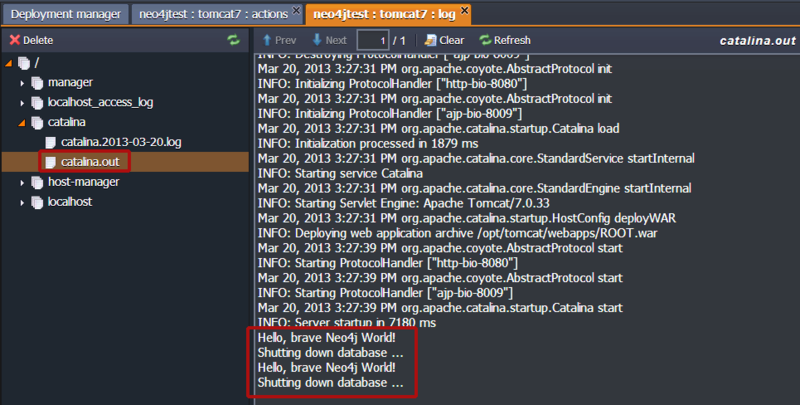 Click Config button for Tomcat and navigate to the home folder and you’ll see your Neo4j database files. That’s all you have to do! Now you have highly agile and fast database right in the cloud. Enjoy with Neo4j and Jelastic! Not sure it’s that efficient? Try now to install your own high-speed graph database Neo4j in the cloud and you will no longer have any doubts. In case you face any issues feel free to appeal for our technical expert’s assistance at Stackoverflow.